The Danish regulation of securities law is highly influenced by Denmark’s membership of the European Union and is based on implementation and direct application, respectively, of EU regulation such as the MiFID II Directive, the MiFIR Regulation and the Market Abuse Regulation (MAR).2 The primary source of securities law in Denmark is the newly introduced Capital Markets Act, which came into force on 3 January 2018 and replaced the former Securities Trading Act enacted in 1995. The Capital Markets Act provides the overall framework for securities trading in Denmark, including rules on offering and admission to trading (prospectus rules), disclosure of inside information and takeover bids. The Capital Markets Act is supplemented by a number of executive orders and guidelines providing a more detailed regulation of specific topics. Other potentially relevant statutes include the Companies Act and the Financial Business Act. In addition, trading at the Danish stock exchange, Nasdaq Copenhagen A/S (Nasdaq Copenhagen), is governed by the Issuer Rules, the Member Rules and the Warrant Rulebook. Litigation of securities claims in Danish courts is not governed by a special set of procedural rules, but by the general rules of civil and criminal procedure in the Administration of Justice Act (AJA). In practice, many securities actions start out with the Danish Financial Supervisory Authority (DFSA) or Nasdaq Copenhagen issuing criticism on the basis of inquiries into potential issues. Such administrative orders or reprimands influence the dynamics of court cases. See Section III. The DFSA exercises unitary supervision of the actors on the financial markets in Denmark and ensures observance of the Capital Markets Act and rules issued pursuant thereto.3 In addition to its supervisory activities, the DFSA assists in drafting financial legislation and issues executive orders about the financial markets. The Copenhagen Securities Exchange began trading in 1808 as a non-profit organisation. Today, the stock exchange exists in the form of the regulated market Nasdaq Copenhagen, which is the predominant stock exchange in Denmark. Nasdaq Copenhagen also operates First North, an alternative marketplace in Denmark primarily for small growth companies seeking to develop. First North is subject to a separate and less burdensome rule book. As a general rule, civil and criminal cases are tried before the district court in the first instance. Only if a case raises issues of a fundamental nature, it may be referred from the district court to the High Court in the first instance. Bringing a case before the Danish Supreme Court in the third instance requires permission by the Appeals Permission Board (third-tier grant), which is only granted in cases that may have implications for rulings in other cases or cases of special interest to the public. The Prosecution Service is the prosecution authority with respect to criminal enforcement of securities law. There are 12 police districts in Denmark where prosecutors appear before the district courts. Cases about serious economic crime are prosecuted in the High Courts by the state prosecutor for serious economic and international crime. Private securities actions, as described in Section II.i, include actions in which investors are seeking damages for misleading or untrue statements in prospectuses or in other published information, in particular company announcements, and actions about unjustified delay of disclosure of inside information. 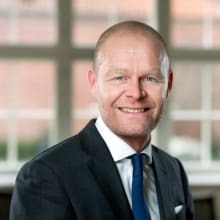 Such claims are typically directed at either the issuer, the management or the board of directors; however, to some extent Danish case law also allows for secondary liability, as described further in Section II.i. Within the area of securities law, the DFSA is typically concerned with cases relating to insider trading, market manipulation and violation of disclosure requirements as described further in Section III.i. Section 12(1) of the Capital Markets Act sets out the fundamental requirement that a prospectus must include the information necessary to enable investors to make an informed assessment of the issuer and the rights attached to the securities. The cause of action available to an investor seeking damages for misleading or untrue statements in prospectuses has been established by the Danish courts on the basis of the general Danish rule of non-contractual liability (culpa liability). According to Danish case law, in particular the Danish Supreme Court judgment in Hafnia6 and the Danish Supreme Court judgment in BankTrelleborg,7 persons responsible for a prospectus may incur liability for investor losses caused by defects in the prospectus that, overall, are of significant importance to an investor’s assessment of the issuer. It is further required that the defects are attributable to those responsible for the prospectus, and that those responsible acted intentionally or negligently. With regard to causal nexus between the material defects in the prospectus and the loss suffered, the Danish Supreme Court established in BankTrelleborg that when a prospectus suffers from material defects, there is a presumption that the share subscription process would not have taken place had the information in the prospectus been correct and adequate.8 BankTrelleborg thus places the burden of proof as to causal nexus in cases about prospectus liability on the defendant. The group of persons responsible for a prospectus naturally includes the issuer and the persons listed in the prospectus as being responsible. In addition, it is recognised in Danish case law and legal literature that it is not in itself decisive who is formally held out to be responsible for the prospectus. The crucial question is whether that person has in fact taken part in the offering phase or in the drafting of the prospectus.9 Thus, it is recognised that the actual participation in the preparation of a prospectus may form the basis of prospectus liability. As an example, in Hafnia, two investors commenced proceedings against the bankruptcy estate and the company’s auditors as well as against the bank acting as financial adviser. Interestingly, in the judgment of 2 September 1999 of the Maritime and Commercial High Court, all defendants were held liable for the losses suffered as a result of an inadequate prospectus. However, on appeal, the Supreme Court did not find the prospectus to be materially defected, and, therefore, the Supreme Court reversed the judgment and acquitted all defendants. Consequently, based on an assessment of the circumstances in each individual case, the person who takes part in the offering phase as an investment bank, auditor, lawyer, adviser, originator business, etc., may incur liability. Naturally, the tasks and roles in the offering phase of the individual persons are likely to differ significantly and may also prove to be different from one case to another. MAR, which entered into force in Denmark on 3 July 2016, and the Capital Markets Act (formerly the Securities Trading Act) provide the causes of action for investors seeking recovery of losses suffered as a result of reliance on published information (other than a prospectus), or where published information has been delayed without justification. that if it were made public would be likely to have a significant effect on the prices of the financial instruments. An intermediate step in a protracted process is deemed to be inside information; see MAR Article 7(3). MAR Article 17(1) introduced a significant change in Danish law, as it replaced the ‘reality principle’ set out in then applicable Section 27 of the Securities Trading Act, according to which an issuer was only required to disclose information upon the coming into existence of the relevant circumstance or the occurrence of the relevant event. Thus, under the former rule, inside information about, for example, ongoing negotiations in connection with an acquisition was only to be disclosed when the negotiations led to an actual result. Under MAR, an issuer must, in such cases, instead make use of the possibility of delaying disclosure in MAR Article 17(4). the issuer or emission allowance market participant is able to ensure the confidentiality of that information. The DFSA must be informed immediately after the disclosure of inside information when the disclosure has been delayed, and the issuer must give the DFSA a written explanation of how the requirements of delay were met. Therefore, when delaying disclosure of inside information, the issuer should make sure it is able to document its fulfilment of the requirements during the entire period in which the disclosure was delayed. 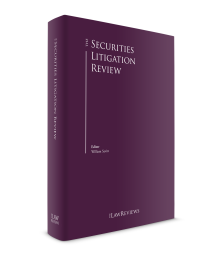 In Denmark, the procedure in relation to securities actions is set out in the AJA, which governs all aspects of both civil (third book) and criminal (fourth book) proceedings. Civil court proceedings in Denmark are divided into two stages: (1) written pretrial preparation; and (2) trial hearing in court. Subsequently, the defendant files a statement of defence before a date determined by the court. After having received the statement of defence, the court will arrange for a pretrial hearing, which will usually be held as a telephone conference.13 At this point, the parties will be expected to agree on a timeline for the remaining case preparation and, if possible, set a trial date. In complex cases, there will usually be a need for further exchange of pleadings and possibly expert reports before the trial hearing. The trial hearing is conducted orally. As a general rule, depositions are not used under Danish law. A party intending to rely on a witness statement must, therefore, call the witness before the court. The costs connected with a civil action in Denmark are (1) court fees; (2) litigation costs, including inter alia witness compensation and expenses for expert opinions and translations; and (3) costs for legal counsel. Pursuant to the general rule in AJA Section 312, the unsuccessful party must compensate the prevailing party for the costs incurred as a result of the action. However, such reimbursement is determined by the court and generally only covers part of the actual costs incurred. Litigants must, therefore, typically be prepared to pay a significant part of their own legal costs, including when succeeding in their claim. With effect from 2008, Danish procedural law allows for group litigation, which is commonly used by investors seeking recovery of losses.16 The cases of Hafnia and BankTrelleborg are both relevant examples. As it is also known in other jurisdictions, parties to Danish court proceedings have a duty to examine the possibilities for a settlement.17 The parties can choose to settle at any point during the case proceedings by entering into a settlement agreement. The parties may decide to have the settlement confirmed by the court by way of a court settlement, which is entered in the court records and is enforceable without further formality. Under the general law of damages in Denmark, an investor is entitled to be compensated in full so that the investor is restored to the position in which the investor would have been, had the purchase of shares not taken place. Danish law does not allow for punitive damages or compensation without actual loss except for particular statutory provisions. Investigation by the DFSA may result in the DFSA issuing an order or reprimand. As a general rule, the DFSA is obligated to publish its decisions.20 Both private and public enforcement of securities claims will often be influenced by any initial inquiries, orders or reprimands of the DFSA. If a violation of securities regulation subject to penalty has taken place, and the violation has been significant, the DFSA will evaluate whether there is a basis for forwarding a police report to the Prosecution Service. Criminal market misconduct offences include: (1) insider trading;21 (2) unlawful disclosure of inside information;22 (3) market manipulation;23 (4) breach of disclosure rules;24 and (5) violation of prospectus rules.25 Furthermore, the application of the MAR has resulted in increased formal requirements on the keeping and maintenance of insider lists and on documentation of notification of insiders and related parties,26 which the DFSA also supervises. Nasdaq Copenhagen supervises and imposes sanctions for violations of its rule books. When the police have completed an investigation, the Prosecution Service will decide whether to bring formal charges, which depends on whether there is sufficient evidence to convict the provisionally charged person. When formal charges are brought, the case is sent to the court along with an indictment listing the charges. In Denmark, a case concerned with serious economic crime, as for instance proceedings regarding non-compliance with securities regulation, is, as a general rule, processed according to the same rules as any other criminal case. Therefore, the differences between Danish civil and criminal securities proceedings are worthy of notice. In criminal proceedings, counsel for the defence may, before the trial hearing, request the police to conduct investigative actions that the defence finds relevant, for example, questioning of witnesses or technical analyses. However, if the police do not find such investigative actions relevant to the case, it will be for the court to decide whether or not to allow the request. As a general rule, counsel for the defence has a right to receive all case materials gathered by the police. The person charged is allowed to review the material, but may only receive a copy with the police’s permission. In criminal proceedings there is no written pretrial preparation as known from civil proceedings. Although being allowed, the defence is not expected to produce any written submissions. For these reasons, the procedural features of criminal securities actions differ significantly from civil securities actions, which, inter alia, usually involve a long exchange of written pleadings. Critics suggest that Danish criminal procedure is, to some extent, inept in its processing of comprehensive cases against financial companies about non-compliance with securities law. When initiating an investigation, the DFSA will typically enter into a dialogue with the financial company subject to investigation, and the company will be given the opportunity to disclose relevant information. Neither settlements in criminal proceedings, nor settlements of administrative actions are possible under Danish law. Pursuant to Sections 247 and 249(1) of the Capital Markets Act, non-compliance with Section 12(1) of the Capital Markets Act (prospectus requirements) or MAR Articles 17 (breach of disclosure rules) and 18 (insider lists) is punishable by fine. Non-compliance with MAR Articles 14 (prohibition of insider trading and of unlawful disclosure of inside information) and 15 (prohibition of market manipulation) is punishable by fine or imprisonment for up to one year and six months; see Section 249(2) of the Capital Markets Act. The standard scale of fines is low compared to international standards. Finally, if the defendant is not domiciled in an EU Member State, exceptional jurisdictions may apply. Under AJA Section 246(3), proceedings may be brought before the Danish courts if the defendant held assets in Denmark at the time when the proceedings were instituted. In principle, this includes any asset of financial value, for example, a negotiable document or a counterclaim, which can be established with some certainty. The entry into force of the Capital Markets Act on 3 January 2018 is the most significant statutory initiative within securities law since the implementation of the ‘Stock Market Reform II’ in 1995. The actual consequences of this change of law together with the changes described in Section II.i as a result of MAR, which entered into force on 3 July 2016, are yet to be tested, and Danish legal practitioners will observe any developments closely. During the past year, considerable attention has also been drawn to a number of lawsuits regarding the former Danish company OW Bunker A/S, which was once one of the world’s largest traders of bunker oil. At the public offering in March 2014 OW Bunker earned a market capitalisation of approximately 5.3 billion kroner, but the company filed for bankruptcy in November the same year after suffering risk management losses (approximately US$150 million) and credit losses in a Singapore-based subsidiary (approximately US$125 million). Currently, there are three pending OW Bunker prospectus liability actions initiated by (1) a consortium of Danish institutional investors (the Prospectus Liability case); (2) a consortium of Danish private investors; and finally (3) a consortium of primarily foreign institutional investors lead by the Deminor Group. Additionally, the bankruptcy estate itself has initiated three proceedings, which were made possible by way of a litigation funding agreement between the estate and the hedge fund Lion Point Master Fund. In the Prospectus Liability case, investors are claiming damages of 767 million kroner in compensation for the loss suffered as a result of the investment in shares in OW Bunker in connection with the IPO. The plaintiffs mainly submit that the OW Bunker Offering Circular of 18 March 2014 suffered from material defects by providing incorrect, incomplete and misleading information as well as omitting information, primarily with regard to the company’s speculation in changes in the oil prices and the trading activity between OW Bunker’s Singapore-based subsidiary and its customer. The 22 defendants in the case include the bankruptcy estate, the board of directors, the day-to-day management, the ultimate owner and private equity fund, and, since November 2017, also two of the four investment banks organising the IPO. More than 15 law firms are involved in the Prospectus Liability case alone. The matter deals exclusively with Danish law and was brought before the Danish courts. The parties involved come from, inter alia, Denmark, Luxembourg, Sweden, Guernsey and England. The case is pending before the Eastern High Court with the oral hearing likely to commence in 2019. The outlook as to private securities actions will be influenced by the progress in the OW Bunker cases described in Section V. The prospectus liability cases will test the requirements for and the balance between the business description and risk factors in a prospectus together with the significance of the pre-IPO process. The outcome of the cases will also have an impact on future litigation about the potential liability of investment banks in connection with a public offering. Interestingly, the Eastern High Court directed on 20 March 2017, in accordance with AJA Section 254, that the Prospectus Liability case is to be heard in connection with another case regarding the former OW Bunker A/S’ potential violation of disclosure requirements (in the period from the IPO to the filing of bankruptcy), which has been instituted by a number of the same institutional investors. This is in addition to the court’s previous decision to hear the Prospectus Liability case together with one of the cases initiated by the bankruptcy estate. The court’s rulings on this matter is likely to impact the processing of these cases, as the cases will now be tried at one joint trial hearing. This naturally has certain benefits, but is also likely to result in a number of practical challenges with respect to the high number of plaintiffs, defendants and lawyers, as well as applicable areas of law. In the context of the proceedings commenced by the consortium of private investors, the Eastern High Court decided on 26 March 2018 that this prospectus litigation was fit to be tried as a group litigation. However, in its decision, the High Court defined the group as investors having suffered losses up until a certain date, and since this group definition excluded a significant number of the approximately 4,000 private investors involved, the consortium has publicly declared to seek appeal of the order to the Supreme Court. The outcome of this matter will impact securities group litigation in the coming years. Conclusively, the OW Bunker cases will make for landmark decisions in that they deal with relatively untested areas of securities law and also raise significant procedural questions. The OW Bunker cases are likely to be finally tried and decided by the Danish Supreme Court, and practitioners will keenly observe any developments in those cases. 1 Karsten Kristoffersen is managing partner at Bruun & Hjejle. The author wishes to thank Josefine Movin Østergaard and Ida Nordholm-Carstensen for their assistance in producing this chapter. 2 Markets in Financial Instruments Directive (EU) No. 65/2014, Markets in Financial Instruments Regulation (EU) No. 600/2014 and Market Abuse Regulation (EU) No. 596/2014. 3 The Capital Markets Act, Section 211. 827945&lang=en (Accessed on 21 March 2018). 5 AJA, Chapter 36 on appeals. 6 Reported in the Danish Weekly Law Reports for 2002 – UfR 2002.2067 H.
7 Reported in the Danish Weekly Law Reports for 2013 – UfR 2013.1107 H.
8 Supreme Court judgment as reported in the Danish Weekly Law Reports for 2013 – UfR 2013.1107.H, para. 1145. 9 Peer Schaumburg-Müller and Erik Werlauff ‘Ansvar for børsemission’ (i.e., ‘Liability for issue of shares on the stock exchange’), article published in the Danish Weekly Law Reports for 1997 (UfR 1997.456.B), p. 460. 18 Bent Iversen and Lars Lindencrone Petersen Danish Business Law, 6th edition (2015), p. 115. 19 The Financial Business Act, Section 351. 20 The Capital Markets Act, Section 234. Subject to the limitations in the Capital Markets Act, Sections 237–239. 21 MAR Articles 8 and 14. 22 MAR Articles 10 and 14. 23 MAR Articles 12 and 15. 24 MAR Articles 7 and 17. 25 The Capital Markets Act, Sections 12(1) and 247.
overtraedelser-af-regler-paa-kapitalmarkedet, accessed on 18 March 2018. 30 Regulation (EU) No 1215/2012 of 12 December 2012. 36 Guidelines No. 9973 of 9 October 2017 by the DFSA.